It's innate behavior for your cat to scratch regularly, and its target is almost always some surface with a texture that allows the cat to sink its claws in. Unfortunately, the material the cat chooses may be your furniture upholstery, your draperies, or your carpet. Your cat isn't honing its claws out of spite or because it's bad. But unless you find a way to break your cat of this habit and direct its scratching to a better target, it can ruin your household furnishings. Once you understand the reasons for this behavior, you're partway along the path to solving the problem. Why Do Cats Scratch the Carpet? This action, referred to as stropping, loosens and removes the outer husk of the claw revealing a sharp new surface underneath. Claw sharpening is an act of grooming for the cat. It exercises the muscles of the forelimbs and spine to keep the cat in tip-top shape for hunting. Some cats scratch by lying down and pulling their bodyweight along the floor. The surfaces they choose to scratch are usually fixed and nonyielding to provide resistance against the muscles they use in scratching. It's also used as a form of communication or marking behavior. Scent and sweat glands between the pads of the feet mix to produce a unique smell. When claws are scraped down a surface, the scent is deposited and the combination of the mark, the discarded claw husks, and the smell provides a strong visual and olfactory message to other cats. It can serve as a precursor to play, either with another cat in the home or with human companions. Scratching may be a bid for attention in some species. If a cat is routinely shooed or chased away when it scratches furniture or carpeting, it may come to associate scratching with receiving attention. When a cat has access to the outdoors, you may see evidence of its scratching on trees, fence posts, sheds, and wooden gates. It's no coincidence that these are all areas that are highly visible to other outdoor cats. Such scratching is a territorial behavior used to communicate with other cats and mark boundaries. A cat that's house-bound, as many cats now are, finds similar surfaces indoors to serve its instinct to scratch, often targeting softwoods and fabric-covered furnishings. Add a horizontal scratching pad. Cats have their own individual scratching patterns and preferences. Those that scratch carpeting may be more inclined to scratch horizontally than use a vertical scratching post. Fortunately, there are scratching pads made for horizontal scratching; some are wedge-shaped inclines and others are flattened out. Experiment to find one that your cat likes. Add multiple scratching posts and pads, covered with different materials and different textures. It's possible that the choice of different scratching options will relieve your cat of its need to sharpen its claws on your carpet. 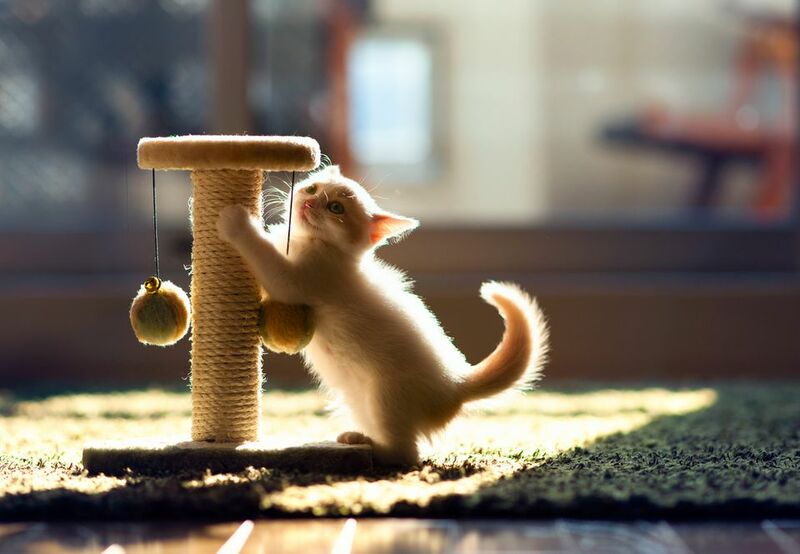 Many scratching posts are covered with carpet, but you should add one or two with a different material, such as sisal, corrugated cardboard, or even plain wood. Remember that cats like varying surface angles for scratching, ranging between horizontal and vertical. So ideally, provide at least one of each: a tall vertical scratching post, a flat scratching mat, and an inclined scratcher. Cover up the spot where your cat scratches. If possible, move a piece of furniture (or a scratching post) to your cat's favorite carpet spot. A sisal scratching post may be a good choice here. For scratching that takes place in front of an entryway, cover the area with a thin mat. Infuse the area with scent. Use a plug-In or a spray by Feliway or another manufacturer in the area where your cat has been scratching. Although these types of products aren't marketed specifically for this purpose, cat behaviorists have found that the "friendly pheromones" in Feliway can fool cats into believing the area has already been "marked" by another cat, thus discouraging scratching behavior. Consider your cat's anxiety level. A cat may resort to more frequent scratching if it's emotionally stressed, such as when it feels threatened by environmental changes or a new pet (or a new child) has recently become a part of the household. Paying more attention to your cat, including playing with it more often, may offer the reassurance it needs to give up its carpet-scratching habits. While you're working on methods to stop your cat's carpet scratching, you'll want to minimize the damage to your home in the meantime. Trim your cat's claws regularly, using a sharp claw-trimming tool. This will help to minimize the damage. Or try using a product like Soft Claws plastic nail caps. If you've never used nail caps before, many veterinarians and most large pet supply stores offer installation and training for a small fee. Your cat probably won't mind Soft Claws, and they'll prevent the shredding-type of damage your cat sometimes inflicts on your rugs.